Afterward Jesus returned to Jerusalem for one of the Jewish holy days. Inside the city, near the Sheep Gate, was the pool of Bethesda, with five covered porches. Crowds of sick people — blind, lame, or paralyzed — lay on the porches. One of John's recurring themes is that Jesus comes to Jerusalem during important feasts to make God's love and grace available to the people. 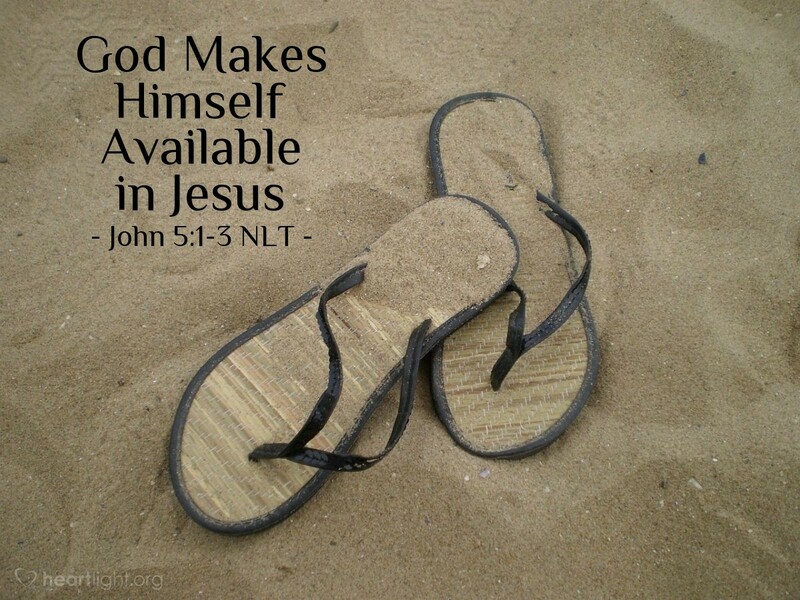 Like he so often does, Jesus puts himself in a place that makes him accessible to everyday people. This group of people in today's verses had serious health problems and had come to a place that legend had made a place of healing. John, however, will remind us once again that Jesus catches up all the legend, tradition, and meaning of his Jewish heritage and makes it all come alive in himself. He is the great healer — not legend, not tradition, and not the feasts. This healer makes God available to common everyday folks. Thank you, Father, for walking among everyday folks like me. Thank you for revealing your glory in Jesus. I believe he is my Savior, Messiah, Redeemer, Healer, Teacher, Lord, and friend. I believe you sent him so that I could better understand your heart. Conform my life to his example and his will. I pray this in his name, Jesus my Lord. Amen.